Chinese people like the doctrine of the mean, and there is a "too far to go", which means that if one thing goes too far, it will not be good enough. Similarly, the recipe design is the same. If a recipe only has pictures and prices, without modifying the text, the recipe designed in this way can not be regarded as a good recipe. Conversely, if a recipe only has text and price, and ignores the part of the recipe, the recipe can only be sloppy. Good recipes, good design, like a talking art, like a golden key to open the door to customers'appetite. When we design recipes, we will describe them in terms of the food itself, cooking technology, nutritional value and health preservation. 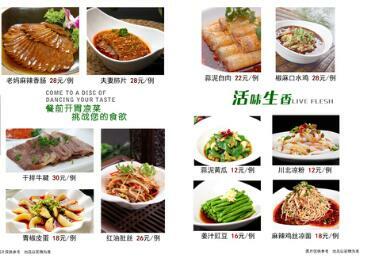 For example: "Stone pot fish is a famous dish in Hunan cuisine. It is made by cutting a large granite rock into a stone pot with two ears. The fish is cooked in a stone pot. Then, it is made by adding various spices mainly made of pepper and some nourishing herbs. Stone pot contains a lot of iron ion elements which are beneficial to human body. It has anti-cancer, anti-aging, wrinkle-removing, gourmet utensils, skin moisturizing and other functions. The fish stewed in a stone pot has the functions of eye-catching, skin-nourishing and brain-strengthening. Simple lines of text, not only said the dish stone pot fish practice, more highlighted the nutritional value and edible value of the dish, will leave the guests a very attentive feeling. However, we should also pay attention to the fact that there are not too many explanations for the copywriting. The copywriting exists to foil the pictures. If the copywriting is too much, the customers will feel that the recipe is more like an introduction to the dishes than an order recipe. It is best to control the number of words in the text description to about 100. The design of recipes with rich pictures and texts is naturally a sharp weapon to improve the profit point of the restaurant, and is the pin of the sea god for the returnees of the restaurant.